The 10-15 minutes it takes for me to cut a smoked duck breast out of its packaging, score the skin in both directions, put it in a cold pan, turn on the heat and render the fat is about as fast as I want any meal to occur. Smoked duck fat: save it for frying eggs or roasting potatoes and veggies in. Maybe make a warm duck-fat vinaigrette to take a bath in? Smoked duck skin: if you can manage to not eat it as soon as you pull its ultimate, crunchy goodness out of the pan, chop it up and put it on anything. You want to get as much mileage as you can out of the breast because they can be pricey. Smoked duck breast adds class to any dish. It just sounds fancy. Doesn’t my Smoked Duck Breast, Mango & Avocado Salad sound like it should be “today’s special” at the country club? I can totally hear Muffy saying, “Dahling, you simply must try the smoked duck salad. It’s to die for and only 100 calories.” Clearly Muffy is a lying scamp! I always have one in my refrigerator so I can just eat it or turn it into a salad or make smoked duck hash, maybe smoked duck fried rice with duck cracklings on top, or a smoked duck stir fry. How about smoked duck breast bao or smoked duck breast summer rolls? I encourage you to keep one on hand for emergencies. My favorites are from Larchmont Charcuterie and D’Artagnan. 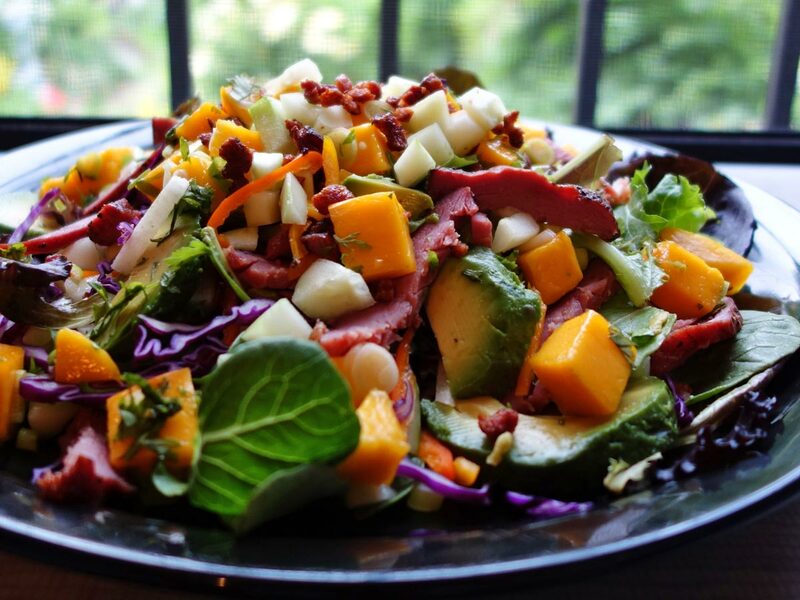 While this Smoked Duck Breast, Mango & Avocado Salad sounds pretty fancy, it’s only because smoked duck breast makes even the most pedestrian dish sound uppity. Say: Smoked Duck Breast, Peanut Butter and Jelly Sandwich—see? It adds instant class. In addition to raising the social strata of any dish, smoked duck breast is a quick fix for any dish. Yes, I’m calling Smoked Duck Breast Oatmeal—trend-spotting! Remove the smoked duck breast from it’s packaging, score the skin in both directions making a diamond pattern, being careful not to cut into the breast meat. Place breast, skin side down, in a cold heavy bottomed skillet. Turn on the a medium-low flame and render the fat from the skin until the skin is crispy, about ten minutes. Remove from heat. Cool and save the leftover fat. Cut the skin from the breast—you may be able to pull it off. Chop the skin into pieces and return it to the pan, stirring periodically to finish crisping and make smoked duck skin cracklings. Smack your own hand to keep from eating them right out of the pan—OK, you can have one. Remove cracklings from the pan. Pour remaining fat in with the duck fat you already saved. Slice the duck breasts, widthwise into 1/4” slices. Assemble salad by mixing the greens with the red cabbage and putting them on a platter. Scatter the cucumber, jicama and yellow pepper over the greens. Place the duck, mango and avocado around the salad, sprinkle on the scallions and the duck cracklings. Serve the Yuzu, Honey & Lime Vinaigrette on the side. A light, tangy vinaigrette made from yuzu vinegar, fresh lime and raw, local honey. Yuzu is an incredibly aromatic, tart citrus fruit that looks like a small grapefruit and tastes like the love-child of a mandarin and a grapefruit and lemon. If I’m putting this dressing on something that’s rich like smoked duck breast and sweet like mango I like to add a little bit of Yuzu kosho to the dressing to give it a little bite; it’s a spicy yuzu-and-chili condiment that you can find in a Japanese grocery or online. Yuzu vinaigrette is frequently made with yuzu juice, but I was gifted some O yuzu rice vinegar, so I made this recipe. I see now that it’s not that common. Feel free to substitute yuzu juice and rice vinegar for the yuzu vinegar. Mix the ingredients together in a jar and give them a good shake. Add sea salt and freshly ground black pepper to taste.